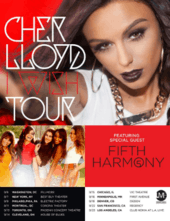 The I Wish Tour is the second headlining tour by British recording artist Cher Lloyd. The tour is in support of her second studio album, Sorry I'm Late, released in May 2014. The tour kicked off on 23 August 2013 in Recife, Brazil. After a few Brazil dates, the tour continued into North America until 3 November 2013 at Orlando. Further concerts were held from February to July 2014 in the United States and the United Kingdom. Fifth Harmony, Zara Larsson and Jason Guthy were the opening acts for the tour. Cher Lloyd spoke about the tour in an interview with Artistdirect. "I really wanted to make it intimate. I want fans to feel like they're almost on stage with me. Connecting with everyone in a room can be a difficult task. I really wanted to open the door a little bit and perform some brand new songs. I'm a little nervous because they obviously haven't been released yet. No one has the actual recordings. Tonight, for the first time, I'm going to be performing them live. I understand they're going to get put on the internet. I'm nervous about it [Laughs]. They're getting a preview of the album, and it's live. I'd better do it well!" 1 2 3 "Introducing Two New Openers For Cher's 'I Wish' Tour". Cher Lloyd. 23 August 2013. Retrieved 30 September 2013. ↑ Marquina, Sierra (26 July 2013). "Cher Lloyd Announces 'I Wish' Tour With Fifth Harmony". Ryan Seacrest. Retrieved 30 September 2013. ↑ Grant, Annie (22 August 2013). "Cher Lloyd to Perform at the Topsfield Fair". Danvers Patch. Retrieved 30 September 2013. 1 2 "Billboard Boxscore". Billboard. Prometheus Global Media. 25 September 2013. Archived from the original on 28 September 2013. Retrieved 30 September 2013. ↑ "Billboard Boxscore". Billboard. Prometheus Global Media. 2 October 2013. Archived from the original on 2 October 2013. Retrieved 2 October 2013.